Gone are the days of animals only being welcome at home. Many hotels now allow pets to accompany their families on vacations or business trips. However, traveling with your fur baby presents a unique set of challenges. From keeping them safe in the car on a road trip or ensuring they have a safe space to relax at night, purchasing a portable, soft-sided travel crate quickly solves many of these conundrums. If you love to travel, and you also love your pets, a soft crate can simplify the issues related to traveling with them. There is a wide array of options available from simple versions that open with a flick of the wrist similar to a child’s play tent to sophisticated luxury models that include safety harnesses and fancy bedding. We’ve examined the top brands available and created a top ten list including our favorite choices. We’ve also included a helpful buyer’s guide to help you decide which features are most important for you and your furry family member. What is a travel crate for dogs? Why do you need a travel crate? The Petnation Port-A-Crate Indoor/Outdoor Pet Home is perfect for taking your furry friend on a trip or using in your home. This durable enclosure features a steel frame endoskeleton and is crafted from a heavy-duty tightly woven mesh, providing monumental strength and durability. Air flows easily through honeycomb mesh windows to keep your pet comfortable. 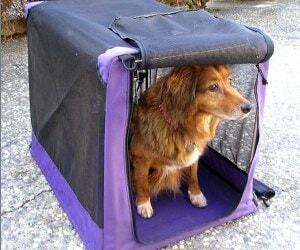 The Petnation Port-A-Crate has both a front and a top door to allow easier access. It’s manufactured with busy pet parents in mind so its extremely easy to set up and break down. Best of all it is easy to clean and maintain, meaning it will last for years and years to come. The NOZTONOZ Sof-Krate Indoor/Outdoor Pet Home is a wonderful choice for larger breeds as it accommodates pets up to 70 pounds comfortably. It is fast to set up and breaks down in seconds. 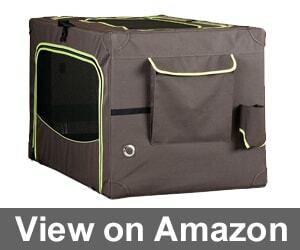 This option is a terrific choice for people that travel with their pets or want an easy to move crate to use at home. The NOZTONOZ features a waterproof base making clean up a breeze. After washing the crate, you can let it air dry before using it again. You can even throw the lining into your washing machine. The EliteField 3-Door Folding Soft Dog Crate is available in a wide variety colors to match any mood or color scheme. It is lightweight, making it a lovely choice for families that often take road trips. This crate is easily placed on the floorboard, the back seat, or in the cargo area making it perfect for keeping Fifi safe while on the road. The EliteField Soft Dog Crate features three doors; one on the side, one on the top, and one on the front of the carrier. This model also has two accessory pockets that are wonderful to place toys or other essentials in. 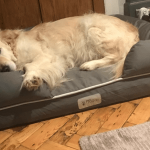 Our pet testers love the fleece lined bed provided with the carrier and cozied up in it immediately. The Pet Gear Generation II Deluxe Portable Soft Crate is spacious enough for larger breeds, yet it folds down almost completely flat for easy storage. Made from a sturdy steel frame, this carrier also features a 600 denier nylon cover that is both removable and machine washable. It arrives with a waterproof mat and a fleece pad to keep your fur baby as comfy as can be. 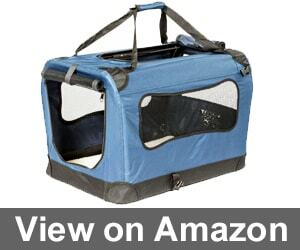 The Pet Gear Generation II Deluxe Portable Soft Crate is extremely accessible with top front, and side entry points. Extra items like leashes, snacks, and toys can be safely stowed in one of the side storage pouches. This item is great for pets up to 70 pounds and works well for travel or home use. The 2Pet foldable Dog Crate features an innovative full-frontal zipper design, which makes it difficult for your dog to chew it up into pieces. This sturdy option is crafted from steel tubing and an Oxford 600 denier cover. Mesh window panels allow your pup to enjoy the sights, sounds, and smells as they relax. The 2Pet Crate is super lightweight and easy to carry or store. This model also has a terrific top handle that makes it easy to transport your pet or to anchor it safely to the seat in your vehicle. The cover is machine washable making it easy to clean up after any accidents. The Arf Pets Dog Soft Crate Kennel for Pet Indoor Home is a lovely option for owners of pets that weigh up to 70 pounds. It’s easy to set up and collapse down. The Arf Pets crate has three different entry points, making it a versatile choice. The Arf Pets Soft Crate is an excellent choice for pet parents that need a soft crate option for crate training. The cover is by far the easiest to remove that we researched. When your puppy has an accident, you can remove the cover quickly and throw it in with the wash, making it super easy to care for while housetraining. The K&H Manufacturing Classy Go Soft Crate is a terrific option for budget-conscious pet families. This model is super simple to assemble, and it folds down quickly. It also comes with a handy storage bag to keep it out of the way when not in use. The K&H Manufacturing Classy Go Soft Crate is a wonderful choice for use during trips or at home. It is sturdy without being heavy or cumbersome. Featuring a removal pad with a machine washable cover, it will be a lovely and comfy crate for any special animals in your life. The Go Pet Club Soft Pet Crate is a great option for individuals that want a travel crate but aren’t looking to spend a lot of money. This option is a basic model, with one entry point and a domed style ceiling. It includes a sheepskin mat and a carrying case as well. The Go Pet Club Soft Pet Crate is inexpensively priced, offering a great last-minute travel solution. Best of all, dogs like this option. The included mat is very comfortable for your fur baby to curl up on and nap. It’s also easy to clean in case of any accidents. The Precision Pet Soft Side Pet Crate is an extremely accessible option, with four separate entry points. It’s water resistant to keep Fluffy or Fido dry and comfortable in case of any rain. Additionally, the hygienic floor resists odors in case of any accidents and it is super easy to clean. The Precision Pet Crate is the perfect choice for anyone that loves to rough it on a camping trip while bring their pet along to join in on the fun. It includes ground stakes to secure it to the ground, just like a tent. We love that this option makes camping trips easier so you and your pet can enjoy spending time together without worrying about their crate becoming wet or moldy. 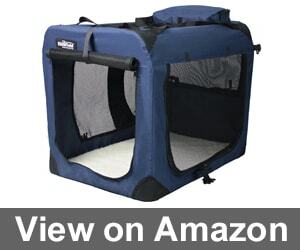 The Petsfit Indoor/Outdoor Soft Portable and Foldable Travel Pet features three mesh sides on the top, front, and side door to ensure your pet stays cool and properly ventilated. It also arrives with a machine washable, soft fleece pad that is super cozy for dogs to nap on. This option is best suited for medium-sized breeds that stand up to 23 inches tall. 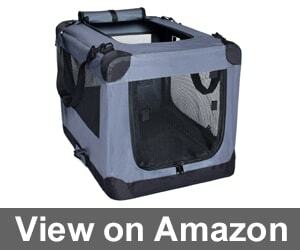 The Petsfit Soft Crate is lightweight and sturdy. 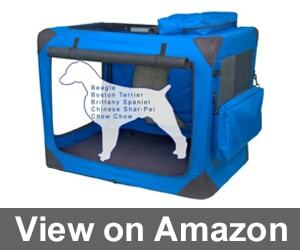 It can be used as an enclosed crate, or the top can be unzipped to allow an open area for your pup to relax in. We love the versatility of this item and your pet will as well. As pets become more like family members, it has become more common to bring them with on trips rather than leaving them at home or boarding them. The quality of soft travel crates has improved steadily in recent years. As a result, the market has been inundated with a vast array of crates from basic models to those that have tons of exciting features. Sorting through the many different types of crates can be frustrating and confusing. We’ve done the groundwork for you by researching the ins and outs of the most popular styles of crates currently available. We created this handy guide to assist you in finding the best option for you and your furry friend. Travel crates are soft sided. They usually are extremely easy and fast to set up and break down. They are also usually constructed from a metal frame that can fold up and mesh or fabric linings. 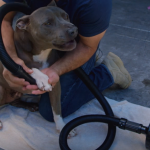 This makes for easier cleaning and allows your pet to receive fresh air while inside. Since so many animals are now crate trained, it makes perfect sense to select a lighter, soft-sided, more manageable model for use while traveling with your fuzzy buddy. These crates are versatile, lightweight, and comfortable. A travel crate is perfect for any family that travels often or is always on the go. Soft crates are a wonderful option for some dogs, but may not be the best idea for every pet. So, how can you choose whether to purchase one? There are a few key rules to keep in mind. • Is your dog or cat especially aggressive? A soft-sided travel crate might not be the best idea if Fluffy loves the claw at fabrics or if Bingo loves to chew on anything and everything. Soft carriers aren’t as well suited to these pets and won’t last very long when subjected to lots of scratching and chewing. • Does your pet have anxiety? Some pets use their crate as a safe space when they are scared or feeling anxious. These animals may prefer a travel option that includes a nice, soft mattress pad to curl up on. • What type of traveling will it be used for? Airlines have specific requirements and guidelines t follow for flying pets. Road trippers may have different needs such as a way to properly and safely secure the carrier in the cargo area or the seat of the car. • A comfortable way to travel: Many pooches adore their soft sided crate because they are extremely comfortable to lounge in. • Less stressful for owners: The purchase of a travel carrier allows you to take your pets more places with you while reducing worries of their safety and comfort. • Less stressful for pets: Many soft crates have sides that allow your pet to watch the world as they drive past and offer a great solution for not wanting to drag a heavier, more cumbersome version crafted from metal or plastic. Your pet can feel safe in their carrier while enjoying traveling. • Stops pet accidents: A travel crate is also excellent for those instances where your pet can’t make it to the next rest stop. Animals have smaller bladders and can’t understand you when you tell them the nest rest area is in 15 minutes. A crate is easy to clean when your pet has a potty accident while traveling. 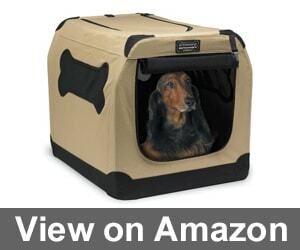 • Size: You need to pick an option that is large enough for your pet to stand up and turn around while in the crate. If you have a puppy, you may want to go with a larger model so it will accommodate them as they grow into their adult size. • Material: Look for items constructed from a lightweight yet durable frame material such as aluminum or steel. Both options are light enough to make carrying and set up simple. These durable metals will also be able to hold up to the wear and tear exerted on a travel carrier. You’ll also need to make special considerations for pets that like to chew. • Bedding: Some versions arrive with a soft bed pad or mattress. Others do not so you will need to purchase one separately if your pet likes to lay on softer bedding. • Cleaning: Many choices have a removable liner that can quickly slip off the frame and thrown into the washing machine with your other laundry. Some require the use of a sponge and gentle cleansing products. Be sure to carefully read through the product descriptions to ensure that any cleaning needs will fit in with your current routines. • Cost: Cost is always a factor, as you should select a mo0del that is affordable yet not cheaply made. 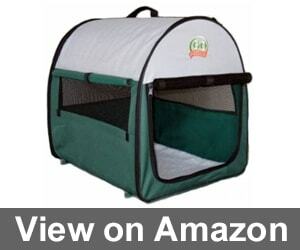 • Comfort: Your pet needs to be comfortable and enjoy being in their new travel crate. Regardless of whether your new travel carrier is for a dog, cat, or any other animal friend, you want to be certain they will fit in it nicely so that they can be comfy and cozy rather than crowded and miserable. Measuring your pet is easy when you follow these simple steps. 1. Measure your pet from the tip of the nose to the end of their tail, if they have one. Add an additional two to four inches to this number to ensure maximized comfort. 2. When examining the options for width, keep in mind that your animal will need to be able to turn around in the crate. 3. Measure the height from the ground up to the tip of your pet’s head or ears so that they can stand up as needed while inside. When in doubt it’s better to go up a size larger instead of selecting a too small option that will leave Fido cramped and squished. Some crates have a specified weight limit, so remember to consider that number as well. You can quickly weigh your pet by standing on a scale while holding them. Then weigh yourself separately, subtracting that number from the first. You’ll be left with your pet’s weight. Keeping your specific needs, preferences, and details about your pet’s size in mind while looking at different options is an easy way to be sure you’ll pick the perfect travel crate for your dog. There are so many wonderful options, and you are sure to find a soft sided crate that keeps your furry companion happier and safer. Please leave us a comment below with your favorite travel crate options or a fun story about traveling with your pet. Thanks a lot for your guide! I’ve bought Petnation Port-A-Crate E2 Indoor, cause we’re going to take our pup travelling with us. I haven’t noticed any cons yet, Tiffany looks happy:) Highly recommend this crate, worth the price! Go Pet Club Soft Pet Crate is the best for my little pup. I wanted to find something cheap and comfy at the same time, and there is a nice mat inside. Recommend to everyone who has a goal to carry your dog from A to B and who doesn’t need extra things. I had a lot of travel crates and I can say that the best one is a crate made from some waterproof material, which you can put in a washing machine. There are so many situations when it can save you not only time but money too. I haven’t changed the crate for 2 years just because of these advantages. Travel crates are so helpful for those who travel with a dog! My dog is always tired of long roads and flights, that’s why it was a tragedy to take him with us. But now he’s just sitting in a little house, where everything is soft and comfortable. I think everybody should buy it to decrease the stress level. When our family needs to go somewhere for a weekend, and we are taking a car, we always put our dog into The EliteField 3-Door Folding Soft Dog Crate. It’s very convenient for road trips, maybe because our dog is very patient if we’re talking about the toilet. Recommend to everyone. Transporting your pet in a travel crate may be very stressful not only for your cat or dog but for you too. I’ve bought a cheap one in a supermarket, I thought it doesn’t really matter, just a simple box with windows. But my mom presented a good one, which she was choosing for a long time, and it changed our travel routine so much! My cat doesn’t try to escape his temporary home, he’s just sitting in a crate with pleasure. Be mindful and read some reviews, don’t be like me. And can you share the brand or the model of the crate you recommend? I want something reliable which will probably work for a long period of time. I have a friend, who doesn’t have such crate and thinks that is it’s soft and made from a textile it’ll be always dirty and wet. But I’m here just to say that if you’re thinking in such way, you’re absolutely wrong! Just look at the crates made from a waterproof material and which are comfortable for your pet to stay not only indoors but in a different transport too. It was very easy to set up The K&H Manufacturing 24 Crate and to use it. Now my pit bull looks very glad being inside of this crate, what more do I need? It has a very useful pocket with 4 strakes for placing the crate on the ground, it hepled a lot when we were on a vacation and needed to create a comfortable house for our dog. Oh, I have the same breed and like this crate too. I was glad to find someone who thinks the same. When you’re choosing a travel crate pay attention to a lot of things such material, size, secure strapping, heavy duty and weight range also. It’s very hard to find the best one, especially if your dog is very active and wants to escape every place she could. Good luck in traveling with dogs, sometimes it’s a big problem. When we only took our dog, she wasn’t used to poop only when we’re walking, that’s why we had so many problems while traveling. We decided to buy a crate which is easy to wash and isn’t hard to throw away. The Arf Pets Dog Soft Crate Kennel for Pet Indoor Home is the best options for puppies. I don’t know how to choose the right crate if your pet doesn’t want to travel in it. Every time he is inside, it becomes a big trouble to make him quiet and calm. He wants to sit only on hands or at least somewhere near. Ugh, it’s hard, it’s like to have a baby. Hope, he’ll get used to a road life. I’m so bad at making decisions, I don’t remember when my choice was right or at least not the worst one. I’ve read so many reviews and guides in order to choose the most comfortable travel crate for my fluffy friend. And I see that maybe it’s not ideal (as usual), all the cons are written, but my dog and I are quite ok with this crate, Oh yes, it’s The Petnation Port-A-Crate E2 Indoor. I had the same crate for a year but we lost it somewhere. And now, after traveling with new two crates I understand it was the best one. 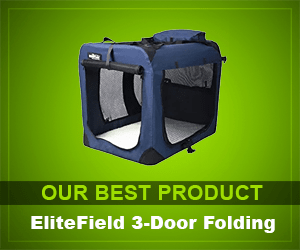 I understand why EliteField 3-Door Folding Soft Dog Crate is your best product because it really works very well. Our dog was afraid of traveling in such things, but now it’s a kind of entertainment for him. When I was searching for the first dog travel crate, there weren’t so many pages with pieces of advice. I just went to our wet and asked what she could recommend for our dog. Now it’s much easier to fing something that will be perfect for your pet. When you’re going to travel with your pet it’s very important to pay attention to some little things like a traveling crate. You should be ready that the dog will be in a big stress. The type you’re choosing depends on the size of your dog, I bought a little crate for my puppy and the bigger wouldn’t be so good. The biggest problem in choosing a travel crate is to buy the right size, that’ll be suitable for your pet. I used some special calculators for this, but your guide helped me with everything else. I finally ordered The 2Pet foldable Dog Crate (liked it for the fabric) and we tried it in a road trip. It’s quite comfortable for my dog, he’s less stressful as I can see. Absolutely agree! The fabric is fantastic. We’ve been using this crate for a half of a year and can’t tell anything bad about it. I finally got the best travel crate. My dog like it very much, but it’s not the most important thing! It fits my car really well! I couldn’t find the right sie for a long time but now I’m the happiest person, my dog doesn’t shake from side to side anymore. 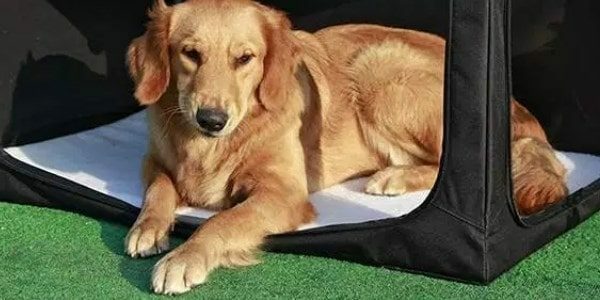 My dog is very calm and not an active one, that’s why The Petsfit Indoor/Outdoor Soft Portable and Foldable Travel Pet is the best variant for us. I’m not afraid that he can chew something or to escape the crate. It’s very light and the price is affordable. Travel crates are such individual thing for every dog and owner. It doesn’t mean that such guides are useless, I just want to say that no matter how much have you learned from the others experience and preferences, it won’t help you when your dog will refuse to sit in this (as everybody said) comfortable and cozy new home. My family usually travel by car and our dog is very active every time, so we’ve decided to buy her own home not to disturb my husband from driving. We came to decision very fast and bought The 2Pet foldable Dog Crate because of its design and lightness. Since we got it delivered we mage 2 long road trips and didn’t have any problems with this crate. Our dog was very calm sitting here. I don’t travel much that’s why I don’t need a good travel crate for my dog. I thought this way a year ago and after months of using and buying different inexpensive crates which my dog hated I gave in and bought an expensive and comfortable one. And my dog was so happy that now we travel much often. I’ve used a lot of crates for my life because I had many dogs and much more trips. Now I can recommend you only The Petsfit Indoor/Outdoor Soft Portable and Foldable Travel Pet crate, I’ve never used anything better really. I’ve bought it as a present to all my friends who have dogs and they agree with me. I wanted to find a comment about this crate as I was thinking of buying it. So now I know for sure what I need, thank you. I can’t agree with you. This crate didn’t work for me really and I had to find something else. So I think it is very personal and depend on many factors. My friends went to Hawaii and left me their dog. Everything was ok until I didn’t receive an important call that I should have gone to another city. It was a catastrophe! I was searching for a travel crate knowing nothing about dogs, crates and travelling with them. But the first one I’ve bought was quite ok, I know that my friends still use it. And now I have a dog too and try to find something really good. Which crate was it? Have you found it on this website? The best crate is the one which costs not much, which is easy to carry, your pet should love it. The pleasant bonuses are when there is a napkin already and you don’t have to buy anything. Look at the variants in the guide. There’s only one that suits everything I said, and that’s because I have this crate for a long period of time and recommend to everybody (I’m talking about The Go Pet Club Soft Pet Crate). Where is the travel crate which my dog wouldn’t hate? I’ve tried a lot of them, at least four, but my dog refuses to sit there! She wants to walk in the car while driving however it’s very dangerous and she couldn’t even move fast enough. I don’t know how to cope with her and only hope that when she will become older everything will be ok. I had the same problem, so I just put a favorite toy inside of it and gave some snacks every time my dog was sitting there. 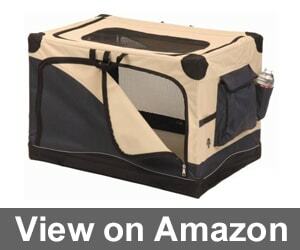 My choice is The 2PET Foldable Dog Crate – Soft. We have owned a lot of other crates before but this one is the best if we talk about its quality and convenience. There is a plenty room for my dog so he doesn’t try to escape from it. Recommend everybody to try this one if you’ve lost in choice. Agree with your opinion! I also think that it’s the best thing I could invest my money in, speaking about the dog equipment. I don’t know why I have listened to my friend and bought something he advised me, so now I have an absolutely terrible travel crate which doesn’t suit my dog anyway. Recommend you to spend hours searching for the best variant rather than listening to somebody. My travel crate wasn’t chosen by me, it was given to me by my boyfriend. His puppy became a huge dog so he didn’t need it. I don’t know the brand and there is no logo on it but that’s a fantastic thing really. I don’t like using any travel crate because there isn’t the better thing than to communicate with your dog all the time and to be closer with your pet. My dog is very calm so I don’t need any special equipment to make him stay at one place. I don’t travel but I bought a travel crate for my dog cause she is strange. SHe doesn’t like sitting on a cushion but in a closed place. I chose The EliteField 3-Door Folding Soft Dog Crate and it’s like a second house for my god inside a flat. It’s very convenient and easy to wash. Recommend to everybody. I can’t find a good travel crate, I’ve wasted so much time on it but there are always a lot of disadvantages. So I don’t know what to do because my friends and relatives don’t have dogs and I can’t get a piece of advice from anyone. When I had a dog I had The Arf Pets Dog Soft Crate Kennel and I liked it very much. Now there isn’t a dog in my house but I still recommend it to friends. A good decision for this money. The K&H Manufacturing Classy Go Soft Crate is my favorite! It’s so easy to install this crate, also my dog likes it. When it’s standing in the house I don’t feel like it doesn’t suit the interior because the colors are perfect. A little pocket on the crate was a surprise for me, and it turned out to be very convenient. The best travel crate for me and my dog is a traveling rug. Fortunately, my pet is the calmest ever and I can be sure we won’t get into trouble. We always travel with our dog using The NOZTONOZ Sof-Krate Indoor/Outdoor Pet Home. Right now it’s the best choice of our life and I don’t think that anything will change. Recommend it to every owner of a big dog. It’s easy to set it up so you won’t have problems. My travel crate was very cheap and I didn’t search for it on the Internet. It cost just some dollars and I’m sure everybody can do this. Why reading tonnes of reviews? It’s just a little pet’s house for some hours. I disagree with you. If your pet doesn’t feel comfortable inside a crate, your road trip won’t be easy. It also influences safety. 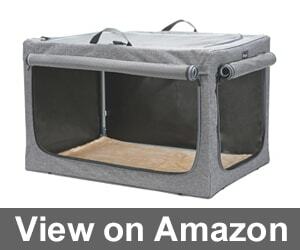 I can’t express how much I like The 2PET Foldable Dog Crate – Soft. It’s the most convenient crate I’ve ever bought. The size, its price, and the comfort it gives to my pet – the things for which I’ve chosen it. Oh, I like this crate too! I think it’s the best travel crate for the dog if you want to buy a high-quality thing and pay not very much. Finding a convenient travel crate for a dog is a problematic task. It should be comfortable and soft so we spent about a week until found the best variant. So be ready to waste much time on it. 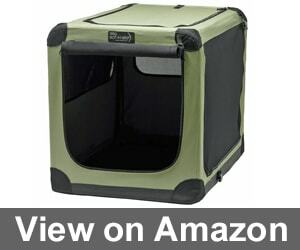 I understand why EliteField 3-Door Folding Soft Dog Crate is an editor’s choice. I’ve been using this crate for a long time and my dog is still happy about it. Choosing a travel crate is challenging. Usually, we buy a new crate, our dog refuses to sit there and we buy a new one. So we’ve changed almost four different crates but didn’t find the right one. I needed a large dog crate and spent many days searching for it. My last choice was Petmate Airline Cargo. I’m not sure whether it’s in this review, but I like it so much that I should share it with someone. The option which I recommend all my friends with dogs and present it them on different celebrations is Go Pet Club Soft Pet Crate. Speaking honestly, it’s all because of the price. But the quality is great so you won’t be disappointed. I think in the same way! It’s a great variant for those who appreciate quality at a reasonable price. The mat which is included with Go Pet Club Soft Pet Crate is awesome! I’ve been using this travel crate for about two months, but I’m happy about it. 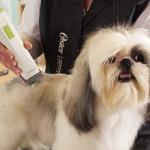 My dog likes it too, so pay attention to this product as it also costs not very much. Buying an additional soft mattress wasn’t in my plans when I bought a new travel crate online. I thought I could use it from the first minutes after the delivery, but there’s was an unpleasant surprise. I recommend everybody to be more attentive and always look at what the manufacturer writes about the products. The most important thing for a travel crate is being waterproof, that’s why I chose NOZTONOZ Sof-Krate Indoor. It helps me to carry my dog wherever I go, fly and drive. Removable pad with a machine washable cover improves the way of travel crate usage. This pad is included in K&H Manufacturing Classy Go Soft Crate, that’s why this travel crate makes me so happy. David Harris here, I created The PetsMaster to give people a better product insight before they make that all important purchase.